The groundbreaking artificial limb can "feel" textures. Dennis Aabo Sørensen sounds astonished as he describes in a video (above) what it's like to have a restored sense of touch in his amputated lower arm, thanks to a new bionic prosthetic fingertip. The Danish man was able to feel various textures -- from slippery to rough -- when scientists recently connected the touch-enabled prosthetic to the nerves in his arm to provide a sense of touch, New Scientist reports. "The stimulation felt almost like what I would feel with my hand," Sørensen said in a statement. "I still feel my missing hand, it is always clenched in a fist. I felt the texture sensations at the tip of the index finger of my phantom hand." The artificial fingertip works by using sensors that generate electrical signals when it moves across different textures, the researchers explained in a paper published in the journal eLife on Tuesday. With the fingertip, Sørensen could distinguish between rough and smooth surfaces 96 percent of the time, according to the researchers. He had previously been able to distinguish between the shapes and softness of objects using a robotic hand. 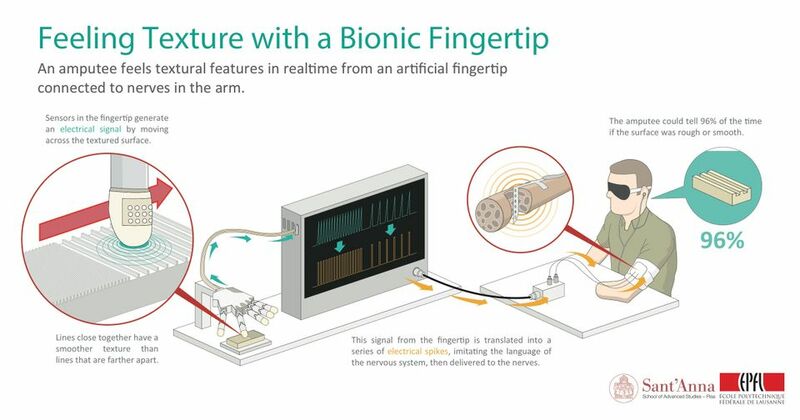 Now, the researchers hope that the bionic fingertip will help to improve future prosthetics, providing new protocols for restoring the sense of touch.